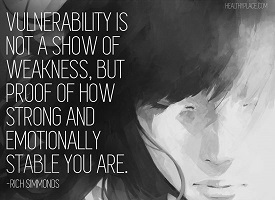 Brene Brown, in her wonderful TED talk on vulnerability asserts that vulnerability is the pathway to deeper connection with others, but there is a catch. To demonstrate vulnerability, one must feel safe. Imagine walking into a job interview and saying, “I am afraid that I am not good enough for this job.” It may be a true statement, but speaking your truth will most likely not improve your chances of getting the job. Now imagine a bunch of men sitting in a circle who have the stated purpose of becoming more authentic and deeply connected. They are accustomed to becoming vulnerable with each other because they feel safe with each other. Imagine that a new man joins the group and can only talk about his hot new car. Do you feel safe becoming vulnerable with a man who can only talk about the superficial aspects of his life? I don’t. Vulnerability has its time and place. There are times where demonstrating vulnerability is clearly not a good idea; and then there are times where becoming vulnerable is the most effective way to engage. Emotional safety means feeling accepted; it is the sense that one is safe from emotional attack. One of the most common forms of perceived attack is being judged by others. Imagine sharing with someone that you had cheated on your partner. For many of us, this would be a highly vulnerable act. Now imagine that this person says, “That’s terrible! How could you do that?” How do you feel about this person? Closer or more distant? My personal take is that I have just been slimed by his judgments and my connection gateway just slammed shut. What would have worked instead was, “Well, brother, you want to take a look at that?” This response doesn’t let me off the hook but it doesn’t judge or patronize me either. I know that I have a friend who can help me examine my behavior in a healthy way. If I experience your judgments of me, I will be less inclined to feel emotionally safe around you and hence I will be reluctant to demonstrate vulnerability. The consequence is that the connection between us will be weaker and shallower. Emotional safety requires a degree of trust. The men in my men’s circle are men that I have grown to trust deeply. I will share and bare my deepest fears with them. I trust them because I know they won’t judge me and they won’t repeat what I have shared outside our circle. Ultimately, creating emotional safety is not someone else’s job. It is my job. And for some of us, this can be very difficult. In the many years of doing men’s work, the single most common theme I come up against is, “I’m not good enough” which is a clear statement of shame. Shame is highly correlated with addiction, depression, violence, aggression, bullying, suicide and eating disorders. Guilt has an inverse correlation with those things. Secrecy, silence and judgment are the ingredients that grow shame. Empathy is the antidote to shame. To be able to experience that empathy, we must come out of our shells and be willing to be vulnerable. And who is the critic? My biggest critic used to be me. I was constantly beating myself up for one failing or another. It wasn’t until I heard a traveling Buddhist monk describe love as “acceptance” that I was able to accept myself for exactly who and what I am. As I found compassion for myself and my humanity, my sense of shame simply faded away. The thoughts, “I am not good enough” and “I accept myself as I am” cannot co-exist. The act of finding compassion for myself trumps shame. I can still feel guilt when I mess up (which I inevitably do), but shame is no longer a part of my life. Oh, I can feel embarrassment about who I was many years ago, but nowadays, those memories make me both cringe and laugh. The consequence of letting go of shame is that my sense of personal emotional safety has become so strong that I can become vulnerable very easily. And I have learned to do the dance: “Let’s be vulnerable. I’ll go first.” I can open with a piece of self-disclosure and wait to see what the other person does. If they respond with something vulnerable, I can go a little deeper. When they stop, I stop. We have established some level of connection that is both authentic and respectful.